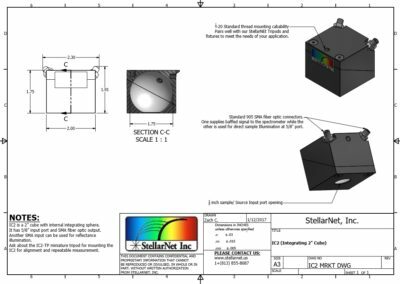 StellarNet designs and manufactures a variety of low cost integrating spheres and accessories for photometric and radiometric applications. Our spheres are available in a variety of sizes to offer customers the most flexibility when choosing a sphere for their application. 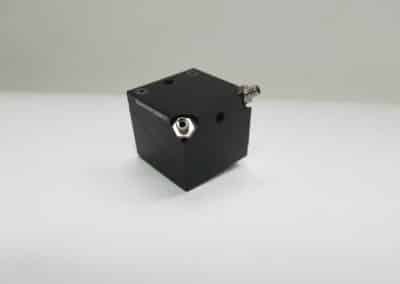 The spheres are extremely robust yet are surprisingly lightweight, compact, and easy to operate. 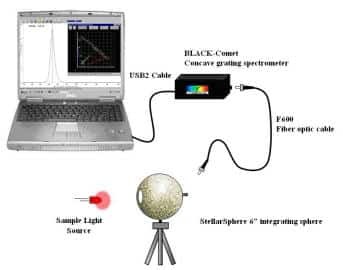 StellarNet integrating spheres, when coupled with a StellarNet spectrometer, provide NIST traceable characterization of all types of light including discrete LEDs, LED arrays, and standard bulbs of various sizes and output intensities. 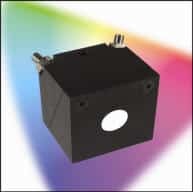 Measurements include absolute intensity in Watts/m2, Lumens/m2, Radiant/Luminous Flux, Correlated Color Temperature (CCT), xy chromaticity, Color Rendering Index (CRI), dominant wavelength, and more across the 200-1700nm wavelength range. 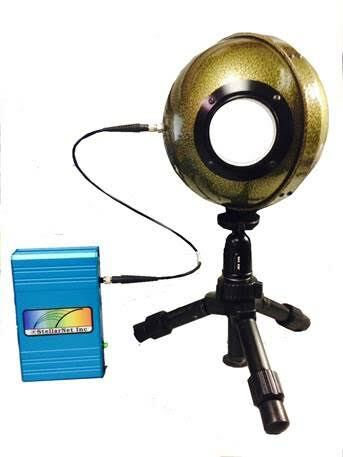 StellarNet 6″ integrating spheres are now available with several port accessories such as calibration lamps, caps, SMA-couplers, and reducers. 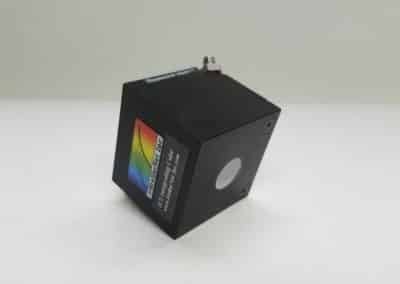 – The IS-Lamp is a Calibrated Miniature 10 Watt fiber optic VIS-NIR light source mounted on a 2″ port cap, 400-1050nm, NIST traceable. 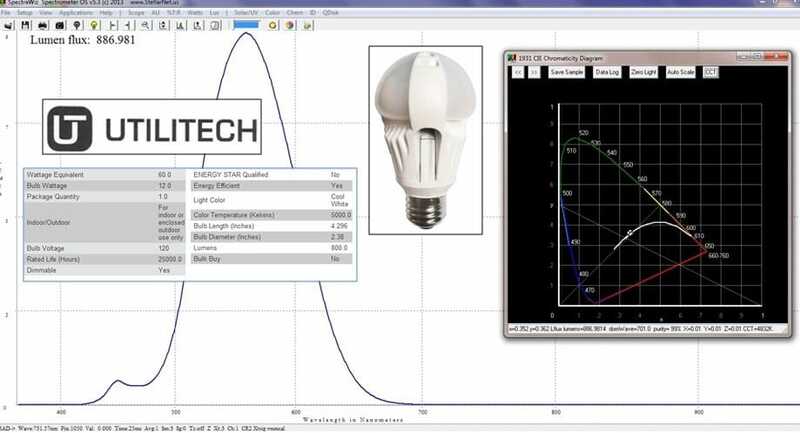 Includes lamp with data file used to calibrate the system for total flux measurements in watts/nm and lumens/nm. 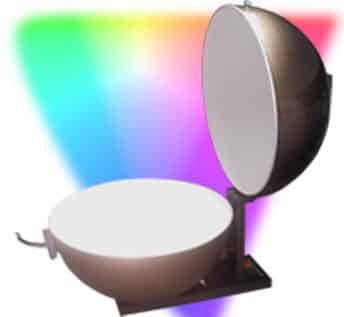 StellarNet’s White Reflectance Coating– on its StellarSpheres is a diffuse white coating paint for reflectance applications covering the UV-VIS-NIR wavelength region. 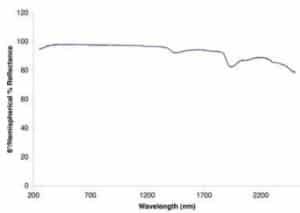 This non-luminescent coating yields reflectance values of 95 to 98% over the wavelength region from 300 to 1700 nm. 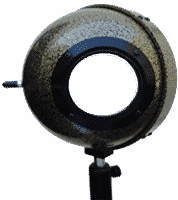 Baffling- A baffle is found in the 6” and 12” spheres and prevents direct light from the input port reaching the fiber optic input port, which can lead to measurement inaccuracies. 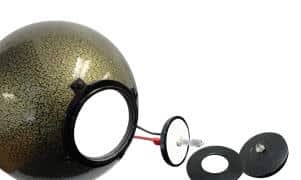 The baffles are constructed of aluminum and coated with the reflective coating used in the rest of the sphere and designed to maintain the uniformity of the sphere. 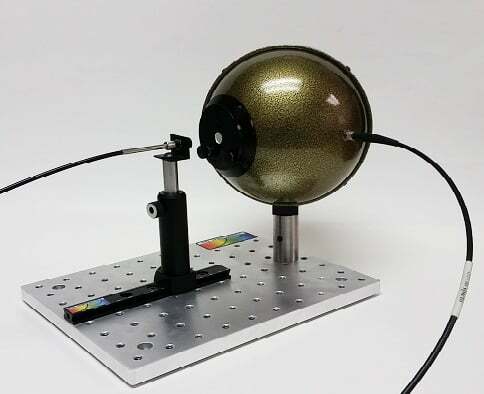 Integrating Sphere Calibration StellarNet’s Tampa, FL manufacturing facility features a dedicated Calibration Lab to provide our products with many calibration options to match specific application requirements. 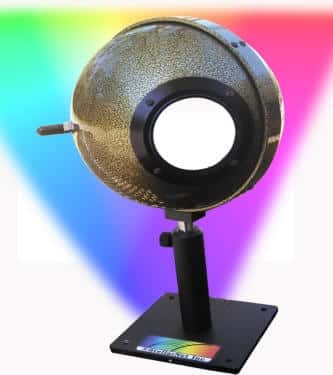 This includes the ability to calibrate for low-light levels, across any range over 200-1700 against NIST traceable lamps, with optional documentation available. We recommend recalibrating your instrument on a yearly basis, but it should be noted that this is not required since all of our components are built rugged, with no moving parts. 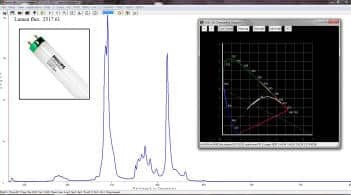 NIST Traceable Calibrations Irradiance Calibrations can be performed by StellarNet using NIST traceable lamps (IRRAD-CAL) or by the customer using SpectraWiz software. 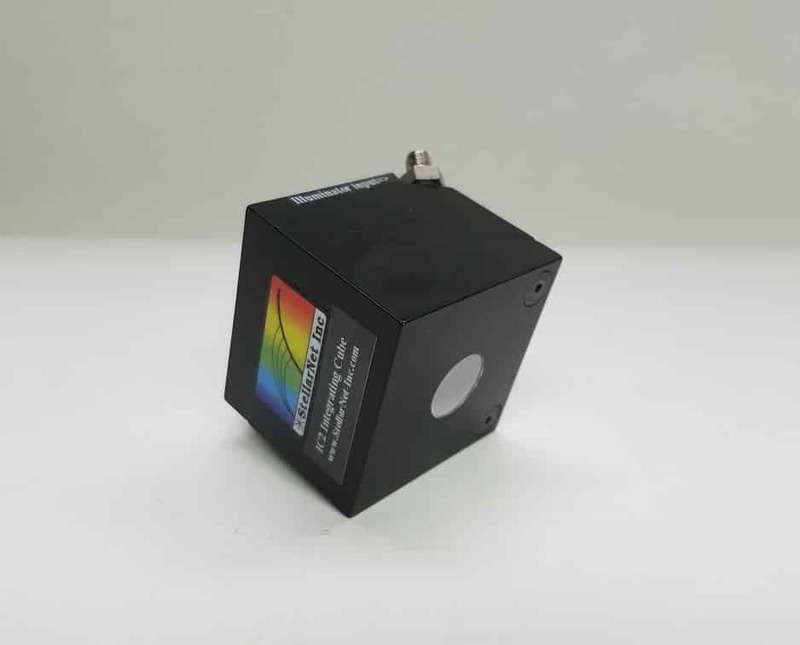 Applications include light source characterization of spectral intensity distribution, color temperature, xy chromaticity, dominant wavelength (and more), for LED, laser, solar, industrial lighting, and any type of light emission. 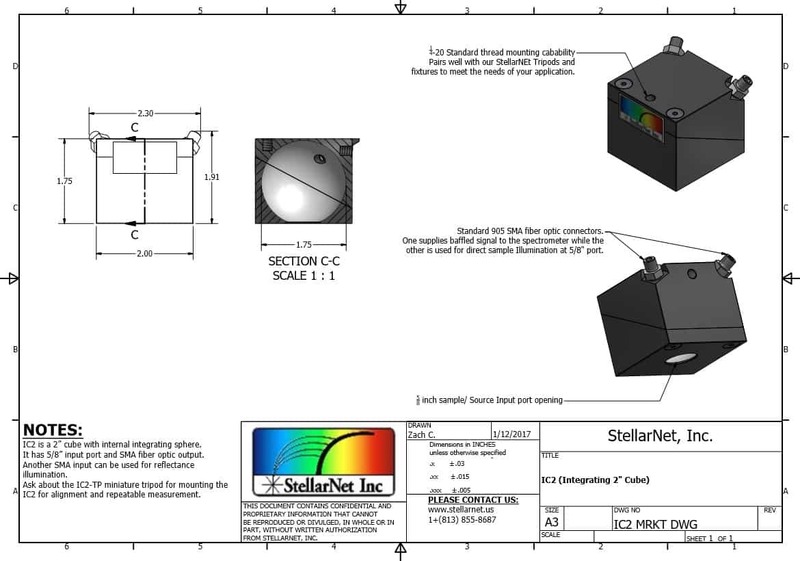 The StellarNet IT5 is a 5′ Integrating Tube designed for measurement of T8/10/12 tube lights. 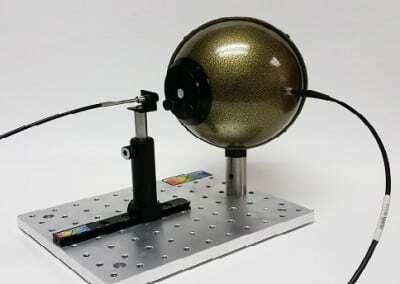 Light measurement of long cylindrical light sources such as fluorescent and/or LED light tubes requires the use of large, cumbersome spheres that require excessive lab space to store when not in use. 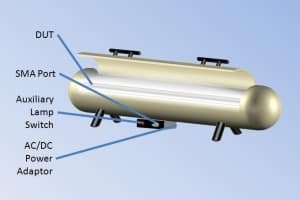 The overall footprint of an integrating tube used to measure the lumen output is significantly smaller than the overall footprint of an integrating sphere used in the same application. When not in use, the integrating tube can be stored in an upright position, which will consume significantly less lab space than its spherical counterpart. 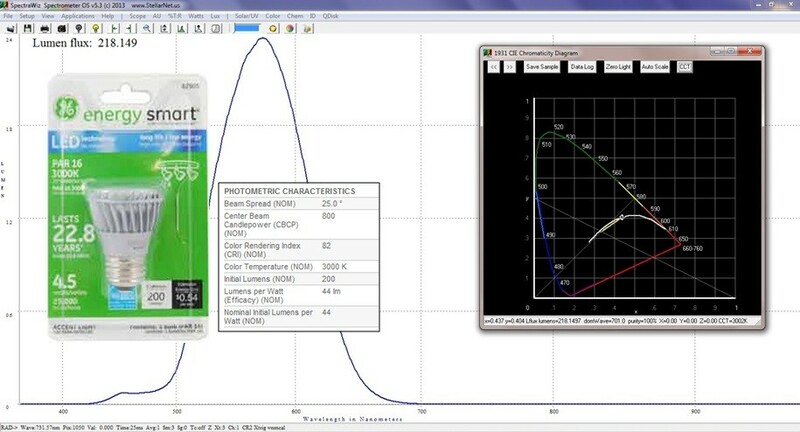 StellarNet IT5 Integrating Tube measuring Philips 2600 LUMEN Fluorescent T8 tube lamp. 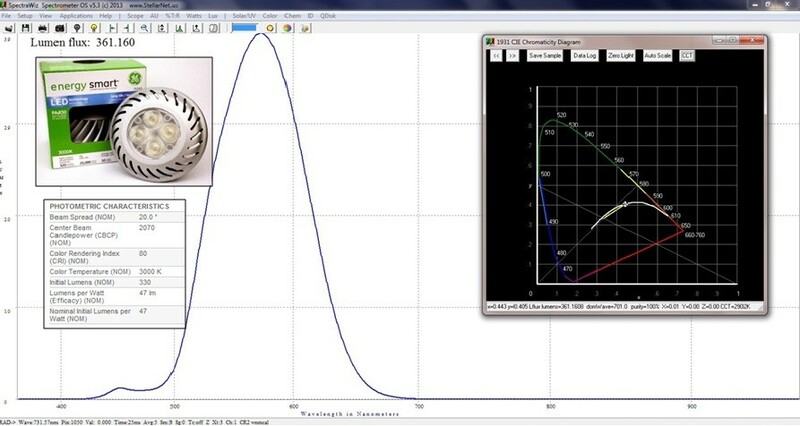 The IT5 is perfect for measuring T8 LED replacements.